Today was my first time doing something “up front” at our newish church in Dunedin. We’ve been attending for almost a year, but I’ve been diligently NOT doing stuff, instead spending energy on completing my PhD. It was REALLY nice to be back contributing today. 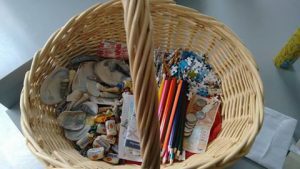 I’d prepared a basket of goodies, which i invited people to select something from as they arrived at church. There were: shells, lollies, money, coloured pencils, birthday candles, bandaids, puzzle pieces, maps. It was fun to give them out: not least to the boy who kept coming back for more (maybe he was hoping I’d soften on the one money/one lolly rule :)). We usually have the prayer for others at the end of the service, when the kids are out at KidzTime, but we moved it so they were still in and got to pray with us too. For the prayer, I’d basically selected a kinda positive and a kinda negative about each item: something to be glad of and something to pray for. I started by naming the fact that as well as holding a physical item in our hands, we also came holding stuff in our hearts: the good and bad of the week past. The things that brought us joy and the things that concerned us. Candle: which we light to celebrate birthdays, but we also light candles at sad times, in memory or to pray. The things we hold in our heart. Why did I pray like this? I like giving people something tangible to hold, and to take away. The physicality of something can help focus our prayer. And it can serve as a reminder of God, and God with us, in the days ahead. I wanted to help people remember that we can pray with everyday things. So when we colour we can be glad of the Creator. When we hear the rescue helicopter, or a police siren, we can pray for all those affected. And to see the good and the hard together. That as we are grateful for the beauty of a beach walk, we can also remember those whose houses are threatened by rising sea levels. Not to make us gloomy, but to make for solidarity and concern beyond ourselves. To create sparks. Sparks that might grow into flames. I was keen for the kids to be in with us, not because it is the sort of thing that we should just do with kids, but because I didn’t want them to miss out on either collecting something, or on praying together. Kids can do the BEST praying! I had some people thank me for all the work, but really we just collected shells on a beach walk, I shopped for candles and pencils and the rest were “found” objects from around the house. (We have a very useful bag of puzzle pieces we bought just to give away like this). So it was easy. And it was connective for people. And fun (for me at least!). My shell will be placed with some of its shell-friends in our bathroom, and will remind me to pray for the world God loves.